11/16/2011: The UO students are starting to ask some serious questions about athletic department finances. For example, why does the athletic department get $375,000 from the academic side for the “President’s Box” at Autzen? The real reason is simple. Athletics gets that money because Dave Frohnmayer put his signature to this secret deal, two weeks before he stepped down as UO President, after AD Pat Kilkenny had contributed some serious money to Frohnmayer’s Fanconi Foundation. But I’ll go out on a limb and guess our latest AD, Rob Mullens, is going to put a slightly different spin on this. Soon he will be claiming those ungrateful students should be glad athletics gets this money, because the boosters in the box with Lariviere are big donors to the academic side. 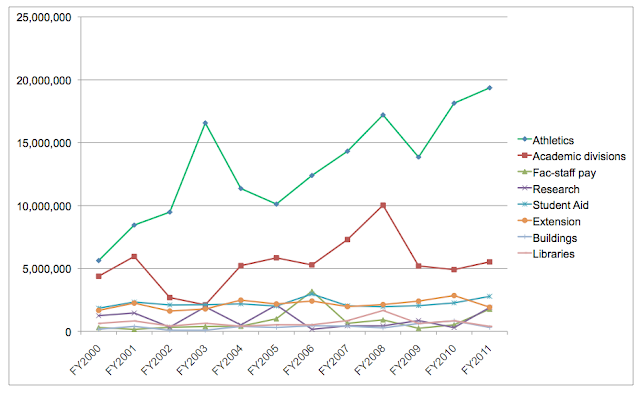 And here’s an update of the UO data on giving to the academic and athletic sides, showing that most of the growth in giving to UO over the past 11 years has indeed been to the athletic side – and this excludes most if not all of the Knight donations, which have all been to athletics since the WRC fiasco. And the UO Foundation has just announced a $1.4 million cut in the amount it provides for academic scholarships – while payments for athletics scholarships are up yet again. Tagged athletics subsidy, Phil Weiler. Bookmark the permalink. Who pays the salaries of those development officers that raise the money? The general fund? Tuition? Are they funded by what they raise? And if the bulk of the money s going to athletics, and if either tuition money or general fund monies pay those salaries, then here we have another instance of the academic side, funding the athletic side. Student aid in that graph flat at a low level for a decade, athletics giving almost tripled to 6 or 7 times student aid, giving to academic divisions flat, at less than 1/3 of current athletic giving. Imagine if student aid/academics had fared as well as a athletics. The unsustainable tuition increases could have been greatly softened. And if I’m not mistaken, that graph is for alumni giving! It is not total private giving the UO Foundation, for sure. Somebody in the Foundation, or better yet the UO Pres, needs to bring this home to the alumni and other private donors: you want to keep tuition under control, you want UO to be academically respectable, you’ve got to think about where you direct your giving! Think about student aid, ordinary operations — at least as much as you think of expensive monuments, or national championship football teams.